Contemporary, flushmount, custom design holds approximately eighty of your favorite wedding images. 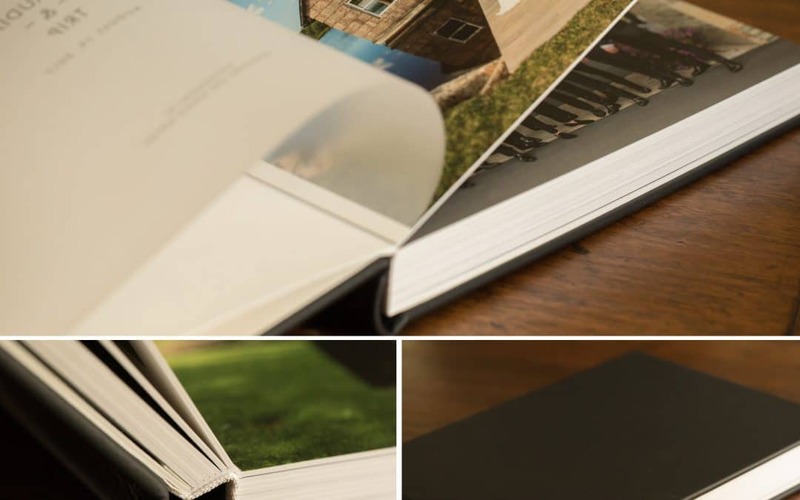 Thick pages are printed on your choice of two fine art paper options: Italian Tinteretto or Satin. The Tinteretto paper has a nice texture to it, like a water color paper. The Satin is completely smooth and has a nice sheen. Neither papers are susceptible to fingerprinting which is a big plus since we know that the pages will be turned again and again. Names are blind embossed on the cover and the album has a vellum translucent title page printed with names and wedding date. There are many gorgeous choices of cover materials: including fine leathers from France, book-binding silks from Japan, and vegan “leather” options. We’ve seen a sampling of all of the cover options and each one is as pretty as the next. Our wedding clients tell us that they love having their Queensberry wedding albums to remind them of their wedding day. Working together as a husband-wife team, we know the tenderness of a love story first hand. We will work together to create the images that will celebrate the story of YOUR wedding day – all the laughter, tears, romance, beauty and yes, and the unexpected. We’ll capture the amazing details that you put so much thought into so that you’ll remember them forever. Your wedding day might go by in a blur of emotion but you’ll have the images we create of your wedding for the rest of your lives together. Our Story-Telling-Meets-Fine-Art style will assure that you have a variety of exquisite images in your wedding image collection. We’ll help you look your best when our hands-on direction is most needed and then fade into the background to be as unobtrusive as possible while we document the unfolding action with a more journalistic approach. We are experienced, classically trained, and technically skilled which prepares us for ANY situation on your wedding day. Find out more about our wedding photography services HERE.